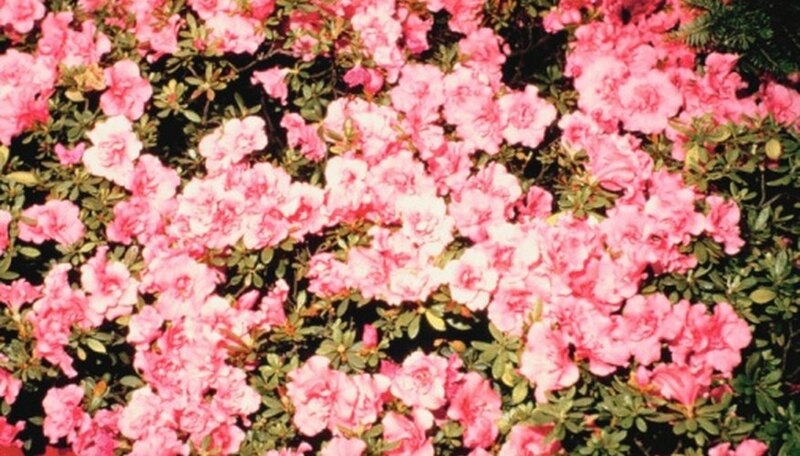 Azaleas referred to as Girard hybrids originated at the Girard Nurseries in Geneva, Ohio. These more cold-tolerant semi-evergreen flowering shrubs boast a complex genetic lineage. Many Girard cultivars contain genes from Kaempheri azaleas that were first developed from the torch azaleas (Rhododendron kaempheri) native to Japan. Girard azaleas grow well in US Department of Agriculture plant hardiness zones 5 through 8, but the colder the winter, the more loss of foliage seen on plants. Lingering leaves in winter develop a reddish tone. Girard azaleas produce variations of either white, red, violet, pink, fuchsia or salmon flowers depending on the cultivar. Around 25 cultivars exist and some similar-looking cultivar flower colors differ in intensity of red or pink pigments, often with undertones of violet. While some in name are "purple," the color in the petals remains more violet-pink than deep, true purple. Pure white, pink and salmon flowers also develop on some shrubs, too. The wide-opening, funnel-shaped blossoms bear five petal lobes. Some cultivars bloom in early to mid-spring, while others in mid- to late spring. All Girard azaleas contain the name Girard in the cultivar name, making it easy for identification. Among the list include Girard Pink, Girard Border Gem (deep rose-fuchsia), Girard Caitlin (pink and white), Girard Caroline (red), Girard Christina (violet-hot pink), Girard Constance (dark salmon), Girard Crimson, Girard Custom White, Girard Dwarf Lavender (lavender-rose), Girard Fuchsia, Girard Hotshot (orange-red), Girard Jeremiah (light pink), Girard Kathy (white), Girard Little Aimee (scarlet), Girard Little Michelle (medium pink), Girard National Beauty (rose-red), Girard Pleasant White, Girard Purple (violet-fuchsia), Girard Renee Michelle (pale salmon-pink), Girard Rose, Girard Sandra Ann (violet-rose), Girard Saybrook Glory (deep pink), Girard Scarlet, Girard Leslie Purple (deep rose-violet), Girard Red and Girard Roberta (dark violet-rose). Variegated green and white leaves grow on Girard Variegated Gem (orange-red). Girard azaleas tend to be compact shrubs, even after a decade of growth. They typically mature in the range of 2.5 to 3 feet tall by 3 to 5 feet wide. Precise mature sizes also vary among cultivars. Those with the words "dwarf" or "little" in their cultivar name remain significantly smaller, in the range of 15 to 24 inches tall with equal spread. Girard azaleas tend to remain disease-free. Plant them in partial shade, about 4 hours of direct sun daily under shifting, dappled light of trees. Keep the soil evenly moist and acidic in pH. Roots of azaleas tend to be shallow, so mulch the ground to keep roots cool in summer and evenly moist. Prune out dead branches any time of year, but other trimming to shape shrubs should occur in spring. You may opt to wait to prune until the flowering display ends. Never prune past late summer as you remove flower buds that open the next spring.